built to convert curious visitors into paying clients that will book out for months. to manage my website. Help? a website designer, developer and strategist dedicated to helping natural health professionals and wellpreneurs get more clients & make a serious impact. "The experiences of creating a website and logo were completely new for me, but Lindsey worked very hard to make sure that my visions became a reality. She patiently answered every email I sent and walked me through the process step-by-step. People who have been on my site have gushed about how awesome it is, and I feel the exact same way! I'm screaming it from the rooftops for everyone to come and visit my site. I could not be prouder that it represents my business and that it represents me!" 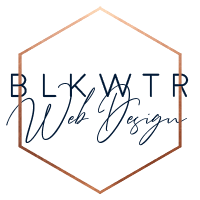 Blkwtr Web Design builds intentional websites for Natural Health Professionals, like yourself, so that you can grow your business or practice with a website that does the work for you by converting casual browsers into excited, paying clients. Whether you're a masseuse, acupuncturist, aromatherapist, chiropractor, nutritionist, health coach, etc., you're in the right place. I help natural health and wellness professionals, like yourself, get your website not only up and running, but converting visitors into paying customers, who will continue to book appointments with you for years to come. Maybe your website is lackluster, and looks like every other website out there for someone in your industry. Or maybe you have a "pretty" website but it's not doing what you want it to (hint: make you money). Maybe you just don't have the time or patience to do it all yourself.